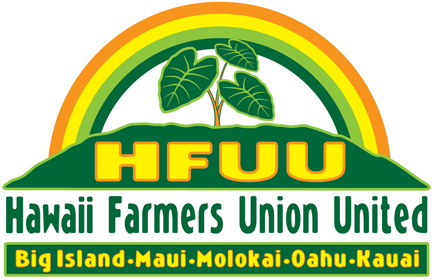 The Hawaii Farmers Union advocates for the sovereign right of farmers to create and sustain vibrant and prosperous agricultural communities for the benefit of all Hawaii through cooperation, education and legislation. The Hawaii Farmers Union, as a chartered state division of National Farmers Union, is recognized and respected as the true voice of Hawaii local farmers. Hawaii Farmers Union empowers island farmers to earn a prosperous living through regenerative stewardship of our lands, waters and communities. Hawaii Farmers Union serves as a bridge between farmers and consumers through vibrant, local, community Farmers Union chapters in all districts on all islands.